Though the Distortion can be considered as a extract of the Rockman Sustainor, it has its own personality, and was not designed exactly for the same usage. It is often said that the DG has a richer sound than the Sustainor, and as a matter of fact, it is more versatile in the complete range of distortion sounds. It seems that the Distortion Generator was created in order to place an economic unit on the market. Nothing new in the DG, compared to the Sustainor, and some features were willingly cleared from the design to cut down the cost. The Distortion Generator was introduced in 1987, and was produced at least until the end of 1991. Just like the Sustainor, it has of course been revised several times, especially at the Autoclean level: just like the Sustainor, a younger unit is preferable to an older unit, at least for the Autoclean improvements. A three positions gain switch called "distortion harmonics"
The combinations are endless, and allow tweaking the sound from a very subtle bluesy overdrive to the most crazy distortion lead sounds. The DG has the two circuits created for the Sustainor: the Autoclean and the Phase Notcher, then a classic treble slider (to adjust the DG to the type of amp - PA or guitar amp) and an output volume. There is also a footswitch that will boost the sound by a few dB's, during a solo for example. Let's review now the evolution of the DG between 1987 and 1991: I have actually identified at least four different versions, the last being of course the best one. 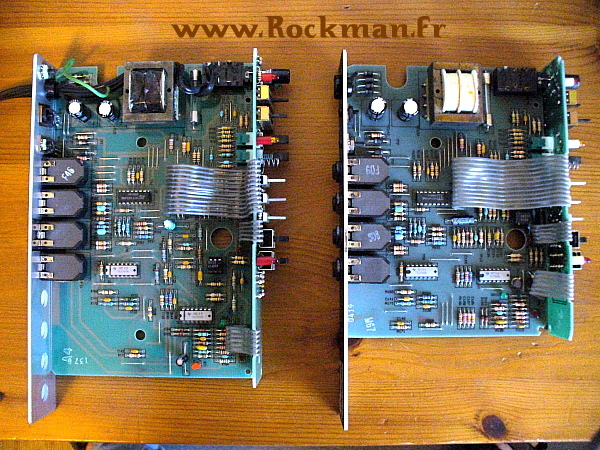 The picture shows two DG's from 1988: January (left) and February (right). They look similar, with some off-board wiring remaining in the January model, but several modifications were made in the design: the older model is slightly more noisy. The PCB was entirely revised (it is much wider), and the sonic difference is very clear: the new DG's have more gain, are more silent, and have an Autoclean that works much better. There is no information about the precise date of this change, but it was probably in 1989. 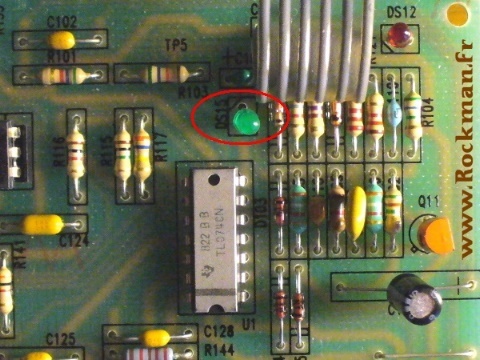 The last modification occured between 1990 and 1991: it was, of course, the Lead-Leveller function. 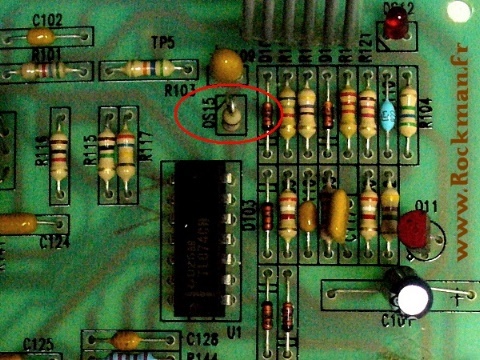 The modification is almost nothing: a resistor instead of a LED in the compressor circuit, that reduces a little the release time of the compressor. 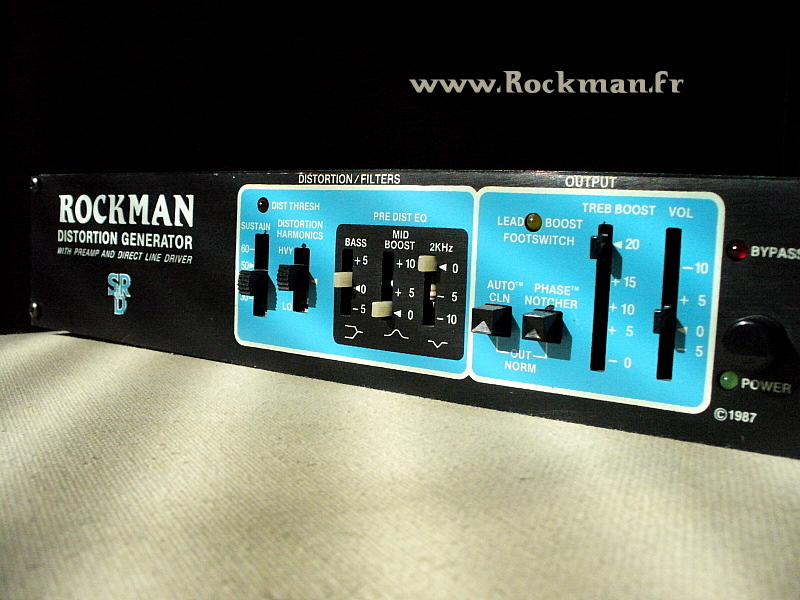 The DG can be used as an extra channel, either within a Rockman rig (in addition to a Sustainor) or with a guitar amp. It is really an amp sim, and must not be considered as a regular distortion pedal! 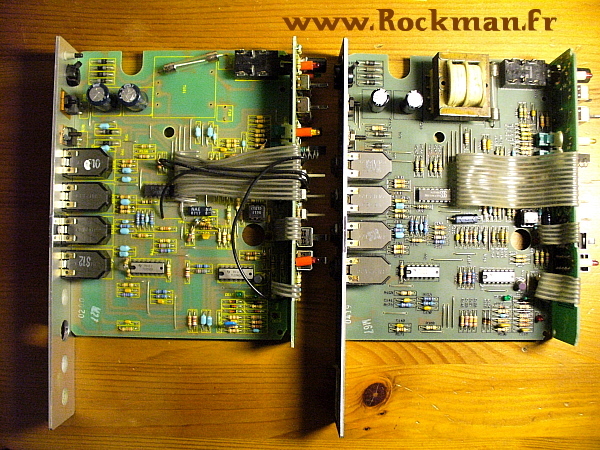 The design of the DG being much lighter, most of the people consider that the DG has more gain and harmonics than a Sustainor. It is absolutely true, especially if you can find a recent DG: the sound is rich and creamy, with more sustain than the Sustainor. The limits of the DG come from what was cleared in order to obtain a cheaper device: no Smart Gate, and no loop for an external pre-distortion EQ. I have corrected that on my September 1991 DG, and added the two features: my DG is now perfect! There are over 15000 Distortion Generators on the market. It is not rare, and it is not expensive: two good reasons to buy one! The only difficulty is to locate a recent model, in order to have a good Autoclean: it's almost the same issue as chasing a good Sustainor 200. A very complete distortion unit, with a very wide versatility. A great addition to any rig.